The kids and I made these sweet little nests last Saturday for the Easter Egg Hunt at Aunt Carolyn's. Fun, easy and gobbled up by one and all! 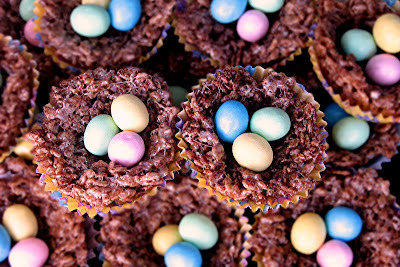 Rice krispy treats made with cocoa krispies, spooned into greased muffin tins, pressed and indented with a buttered spoon, allowed to set until not totally gooey and placed in festive cupcake papers, chocolate eggs lovingly divvied and positioned in nests, nests lined up and stacked on the biggest tray we could find, presented with a big grin, consumed with zeal! Cute and yummy idea...I'm going to have to save that one for next year.